Compiled by Th.Ulich, Sodankylä Geophysical Observatory, Finland. This page is meant for people in Northern Finland who would like to know how likely a display of the Northern Lights in their area is in the near future. Please note, that this service is not a forecast as such, but it enables you to make your own forecast by looking into the information provided through the links below. If you want to learn more about the Northern Lights, why they exist, what causes their colours, or why can we see them only at high latitudes, then have a look at my Entry points for studying the Northern Lights, which includes also tips for observing the aurora. However, if the weather is bad, you might want to look at some beautiful photographs. Time in UT: In auroral science, we work in terms of Universal Time (UT). At the end of this document you'll find a conversion table. Length of Day and Night at Oulu, Finland, are given below! Presto Alert of the Solar Influences Data Analysis Center (SIDC), Royal Observatory of Belgium, Brussels, Belgium. Oulu Aurora Spotters is an English-language Facebook Group for Northern Lights hunting mainly for people in the area of Oulu, Finland. Issued daily at 2200 UT by the Solar Environment Lab, USA. This bulletin tells you about the current and expected activity levels of the Sun and the Earth's magnetic field. Geomagnetic activity levels are quiet, moderate, severe, ... Most interesting are the probabilities of activity for the coming three days at the end of the page. Probabilities of 20% and greater usually mean that there's something to see, but the higher value the better, of course. The Sun rotates around himself once per 27 days, and some disturbances on the Sun's surface can persist for many months. Thus a reccurance of Northern Lights 27 days after a beautiful display is not unlikely. This page tells you the expected activity levels from today to about 27 days ahead. Again, the higher the given values, the higher the probability. The Sodankylä Geophysical Observatory has a digital camera with a special lens which can see the whole sky from horizon to horizon. Whenever it is dark enough, it takes one picture of the night sky per minute. 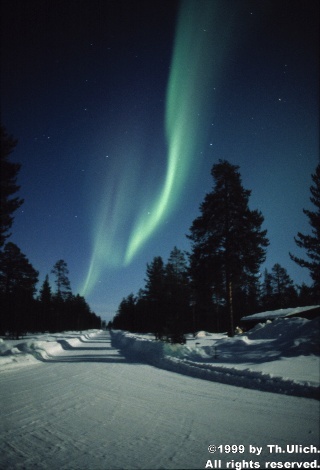 The image will tell you whether there are Northern Lights visible above Sodankylä. If you see the lights at the lower edge of the image, they are about 300 km south of Sodankylä, i.e. they are just above Oulu! Of course, it might be cloudy in Sodankylä but clear in Oulu -- or vice versa. Real-time measurement of the Earth's magnetic field, updated every 5 min, issued by the Sodankylä Geophysical Observatory, Sodankylä, Finland. Please note the information called "Fullscale" in the titles of the diagrams, if this number grows, it is getting interesting (normal quiet situation: 100 nT or so). Check the curves for rapid variations, meaning changes of a few hundreds of units (nT) within minutes, then you are sure that you can see aurora in the vicinity of Sodankylä and very likely also in Oulu. If the drop is 400 nT or so, then you can almost certainly see something in Oulu, but at 700 nT it'll be more beautiful. Beyond 1000 nT the aurora might even be too far south to be seen in Sodankylä, but probably there'll be beautiful lights above Southern Finland, which might be visible even in Tallinn. Remember, however, that clear skies are a must! 30 hrs: This diagram contains data of the present day (in UT) plus the last six hours of the previous day (1800 UT - 0000 UT). 2 hrs: This is a higher resolution plot of the same data as in the 30-hrs plot, it contains the data of the current hour plus the full previous hour. This plot is the better option when there's lots of variation in the diagram. Statistical region of occurence of Northern Lights in the Northern and Southern Hemisphere. Your best guess on the probability of seeing the aurora. Red means a high probility. This service provides a weather prediction for your area of Finland. Note that Foreca offers many more locations than I have listed here. Just click on GO! and then select another place (or even country) from their web page. Foreca's prediction is more detailed than that of FMI (see below) and at least according to my experience, often holds rather well. Here you see the short-term forecast map of the Finnish Meteorological Institute, the same crude map (in principle) which they give to TV and newspapers. These pictures show you where it was raining in Finland and how the rainy areas moved across the country. You can easily guess in which direction they will continue, but of course they might simply disappear, too. Several times a day, the Finnish Meteorological Institute receives a satellite picture of the cloud cover over Fenno-Scandinavia. This satellite photo gives you an idea of the expected cloudiness. This is a similar service as the previous, but covering all of Europe,	the data coming from the METEOSAT satellite. The pictures are updated four times per day, at midnight, 6 a.m., 12 p.m., and 6 p.m. In many of the data sources provided here, time is given in "Universal Time," which usually is given in the format HHMM or HH:MM followed by the two letters "UT", where the first two digits are the hour and the latter two are the minute. Hours range from 00 (midnight) to 23 (11 p.m.). In Finland we normally use East European Time (EET). However, if you are reading this in Sweden or Norway, you are normally using Central European Time (CET). Daylight saving time ("summer time") begins on the last Sunday in March, when the clocks are advanced by 1 hour: at 03.00 h it will be 04.00 h (in Finland). Note that in summer, the time zone is correctly called EET DST (for daylight saving time) or sometimes EEST (East European Summer Time). However, for the table above it's just less confusing to omit this detail.